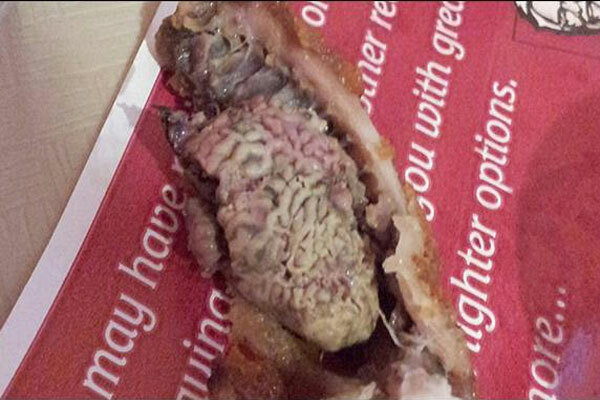 Fast food giant KFC has apologized to a UK student after he came across what appeared to be a chicken’s brain in his meal. Ibrahim Langoo, 19, of Essex, was eating at the Colchester restaurant in December when he came across the brain-like organ in his chicken, The Sun reports. Horrified by the sight and unable to bring himself to pick up the object, he photographed the food and complained to staff at the counter. “I have a habit of picking the chicken off the bone with my fingers and as I pulled the second piece apart, I saw this horrible wrinkled foreign body,” he said. Mr Langoo posted the picture to his Facebook page where it was shared almost 500 times. “For all those that wanted to show their friends and families, here is the reason to never go to KFC ever again,” the caption read. KFC had the photos analysed and do not believe the object was a brain. “Although we haven’t received the product, it appears from a photograph that unfortunately on this occasion a kidney, and not a brain as claimed, was not removed in the preparation process,” a KFC spokesperson told The Sun. The apology fell a little short with Mr Langoo who said he will not be eating at the restaurant anytime soon. “KFC say they are sorry and are concerned to hear of my experience as they have ‘rigorous standards’ but I’m still not impressed,” he said.